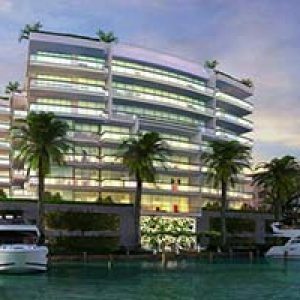 The luxury residences of the Gale Hotel and Residences are now for sale at 2900 Riomar Street in Fort Lauderdale. A 12-story project by Newgard Development and architect Garcia Stromberg, all 128 luxury residences and 96 hotel suites at The Gale are fully furnished. Signature retail stores and fine dining restaurants are located in the complex on street level. The Gale Hotel & Residences offer premium concierge services, an exclusive residence club, vast rooftop sky deck, modern fitness center and a number of swimming pools. This historic property from the 1940’s will be outfitted with all modern interiors. The luxury residences are currently for sale and construction is expected to be completed in 2017. 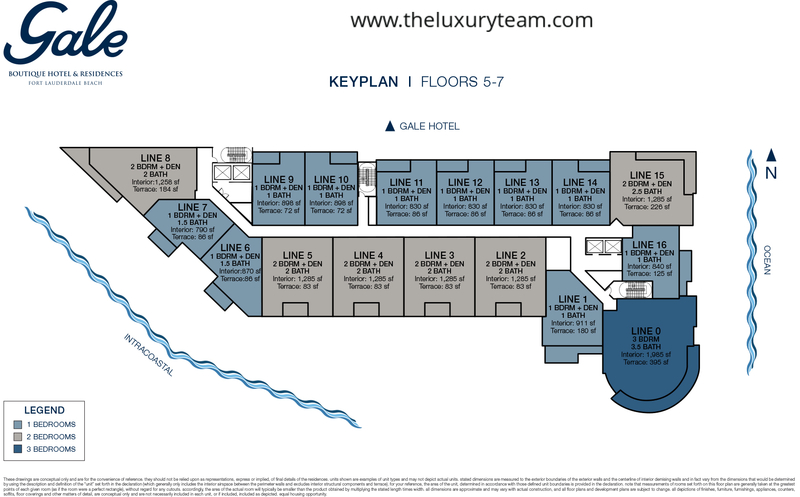 The luxury building is only 5 minutes away from beautiful Fort Lauderdale beach and the Atlantic Ocean. Residents will benefit from the following services – 24-hour welcome desk, premium concierge service, 24-hour valet parking, resident secured parking, and high-tech resident parking system. 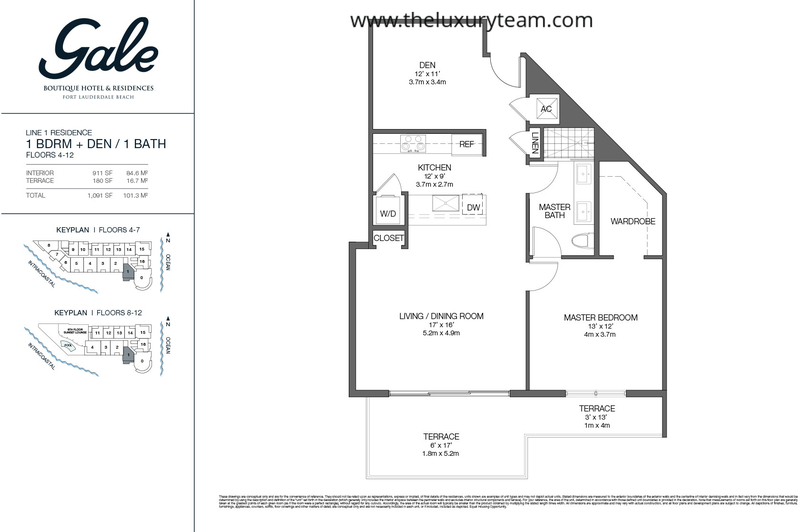 The Line 1 Residence features 1 bedroom, 1 bathroom, and a full-sized Den. 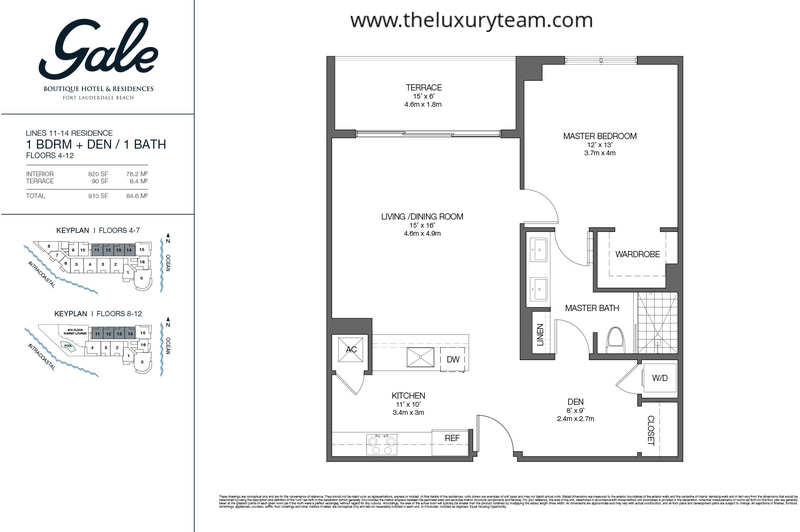 This unit is available on floors 4-12 and offers 1,091 total square feet of living space. The expansive 17×16 Living/Dining Room opens into the 12×9 Kitchen area and 12×11 foot Den. 180 square feet of terrace space is available for your leisure. 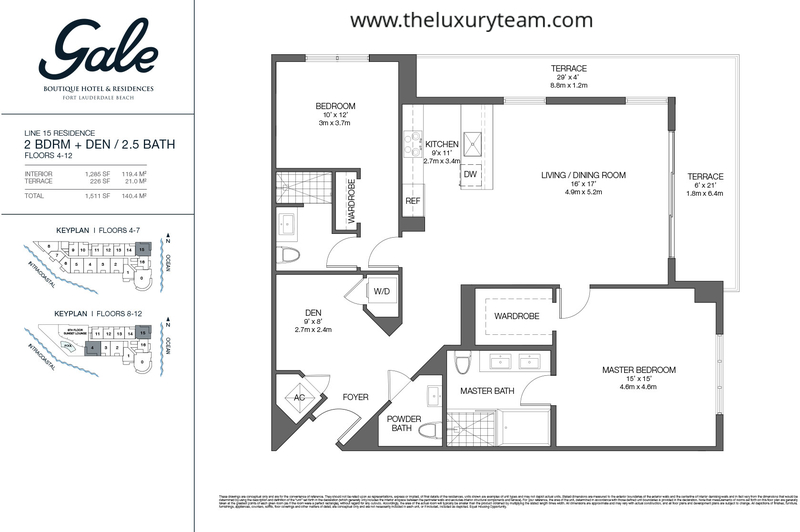 The Line 3 Residence is available on floors 9-12 and features 1 bedroom, 1 bathroom, and a full-sized den, with slightly smaller accommodations at 970 total square feet. The 11×10 foot Den area can flex into a home office or additional bedroom depending on your needs. 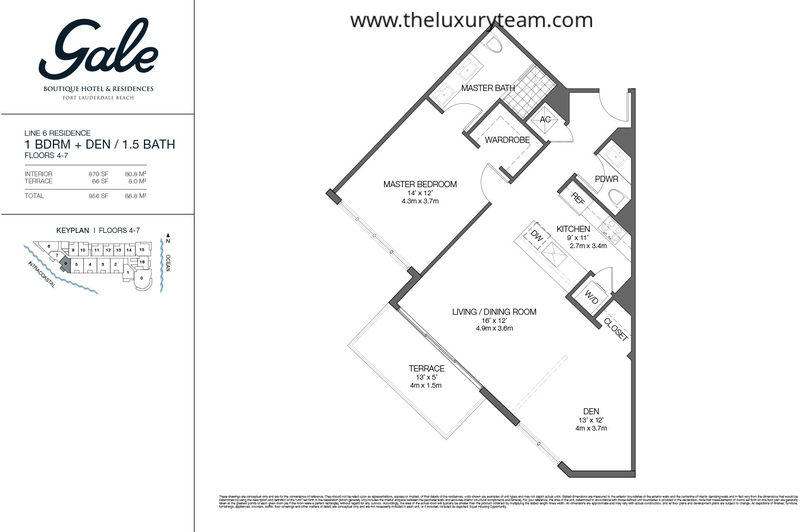 The Line 6 Residence rests on the South side of the building and is available on floors 4-7. 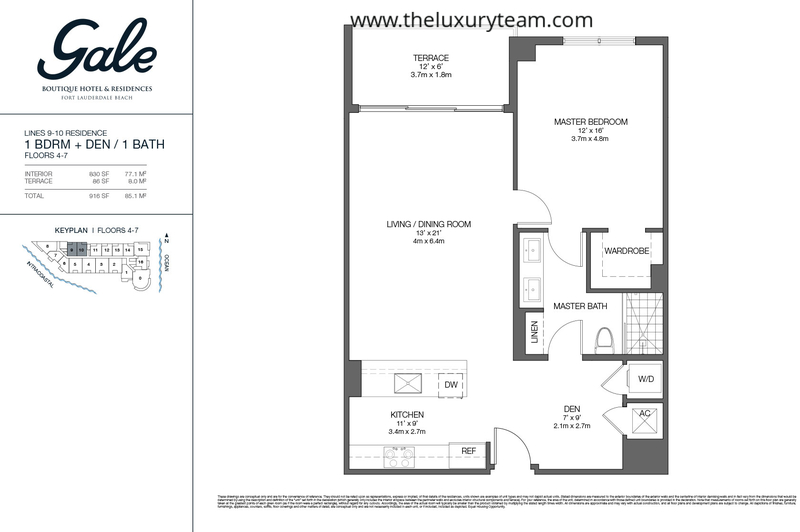 The unit features 1 bedroom, 1.5 bathrooms, and a full-sized Den. The Living/Dining/Den areas are combined to form one large living area. The Line 7 Residence is similar to the Line 6 Residence but located on the West side of the building. 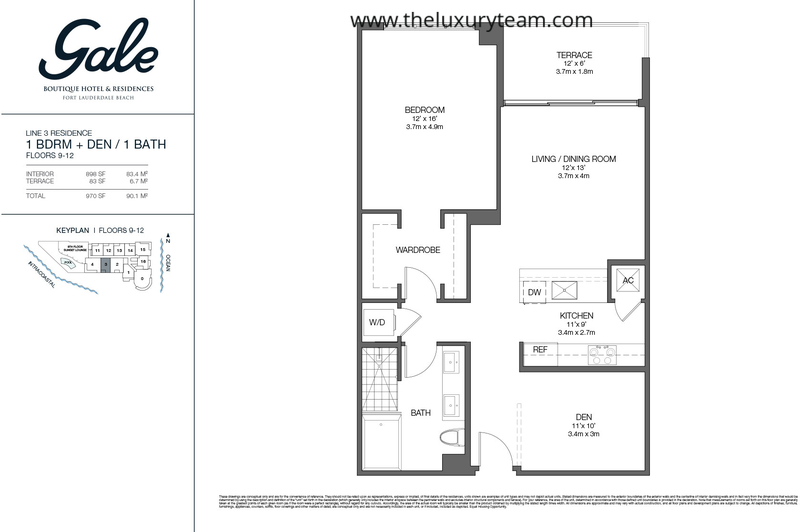 The unit features 1 bedroom, 1.5 bathrooms, and a full-sized Den. The spacious 12×14 Master Bedroom provides direct access to the Master Bathroom and wardrobe areas. 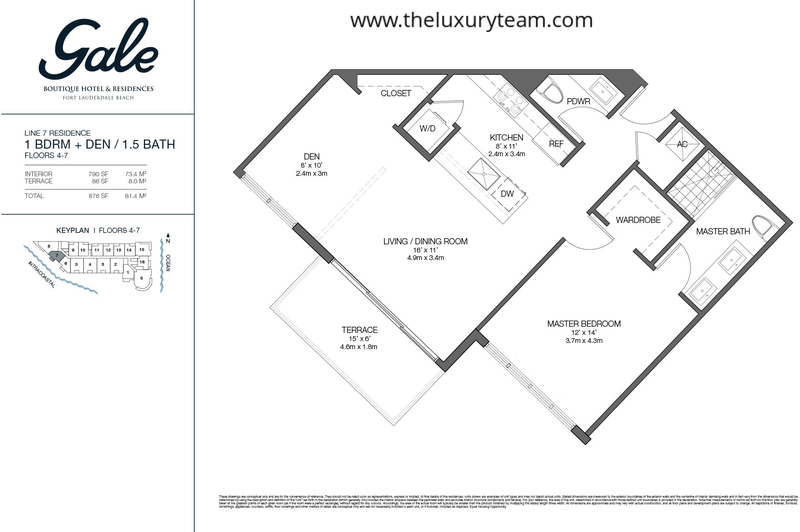 The Line 9-10 Residences are available on floors 4-7 and feature 1 bedroom, 1 bathroom, and a full sized Den. These 916 total square foot units have an expansive 13×21 Living/Dining area and a 12×6 outdoor terrace. Line 11-14 Residences are available on the North side of the building and are identical in size and design to the Line 9-10 Residences, featuring 1 bedroom, 1 bathroom, and one full-sized Den. 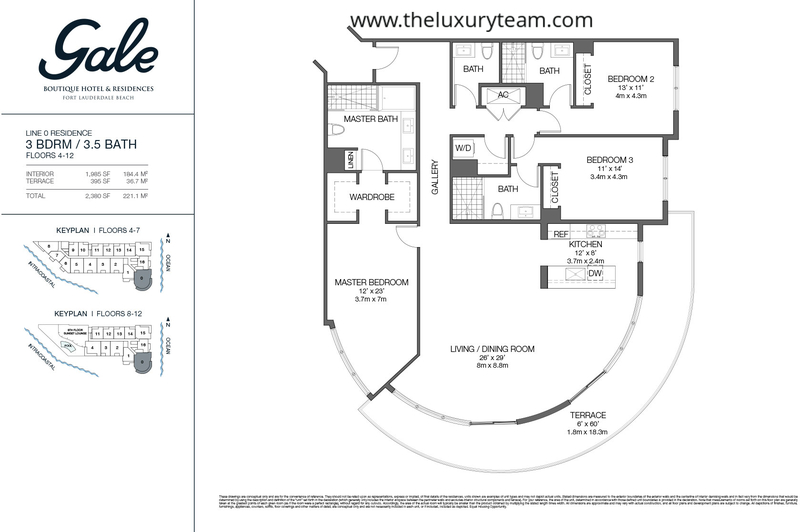 The Line 15 Residence is a 2 bedroom, 2.5 bathroom luxury residence with a full-sized Den. Located on the Northeast and Southwest corners of the building, this unit features an angled terrace for maximizing sun exposure. 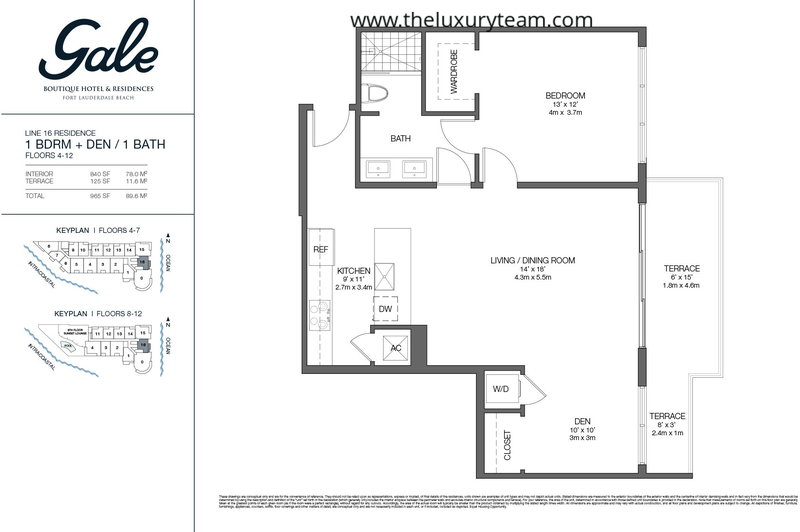 The Line 16 Residence is a 1 bedroom, 1 bathroom luxury residence with 965 total square feet of living space and a 125 square foot terrace. The expansive 14×18 foot Living/Dining area opens up into the full sized 10×10 foot De, with both rooms providing direct access to the outdoor terrace. The Line 0 Residence is the most spacious and luxurious available in all of Gale Fort Lauderdale, available on floors 4-12. This 2,380 total square foot masterpiece features a circular floor plan on the Southeast tower of the building, including a wraparound terrace with 6×60 foot dimensions. The 12×23 foot Master Bedroom opens directly into an expansive wardrobe and Master Bathroom. One of the major benefits at Gale Hotel Residences is the exclusive clubroom with its own kitchen and bar that the residents can use to host social events. These luxury residences come in 1, 2 and 3 bedroom designs and include features like full-width oversized balconies, sliding glass doors, floor to ceiling impact glass windows, imported cabinetry, gourmet kitchens outfitted with top of the line appliances, and spacious walk-in closets. Prices range from $385,000 to $1,500,000. Other amenities include smart building technology, modern open-concept floor plans, contemporary hardware, spa-like amenities including soaking tubs in the master bedrooms and glass shower enclosures. Every resident can enjoy hotel services at all outlets including restaurants, room service, bars, fitness center and Menin Hospitality Membership Privileges. Hotel guest amenities include top of the line design aesthetics, marble bath appointments, luxury cotton linens, deluxe bathrobes, an in-room safe, a steamer, and a fully stocked mini bar. High tech amenities like an ihome docking station, WIFI, 60″ LED HD television, control4 automation outfit a spacious work desk and lounge area. What is there to enjoy around The Gale? 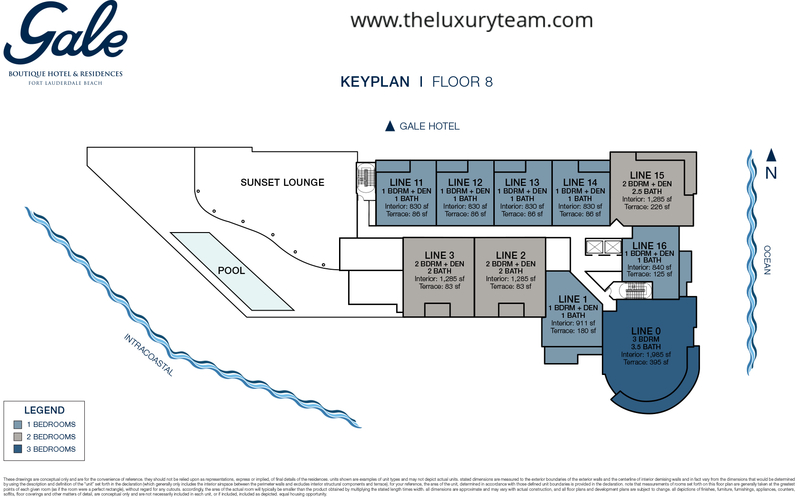 Gale Hotel & Residences are close to Fort Lauderdale beach which stretch for miles north and south. Just to the south of the building is Las Olas Boulevard, which makes up part of the city’s downtown area. Fort Lauderdale and Hollywood International Airport are just minutes away.. Other nearby places of interest include Bonnet House Museum and Gardens and The Galleria mall, all of which adds to the living experience of the residences of Gale residences. Where can I find the Gale Hotel and Residences? It’s very easy to spot from the beach, and can be found at: 2434 E Las Olas Blvd, Fort Lauderdale, FL 33301. The condo is filled with amazing amenities, but you may not be able to access them without a condo membership. 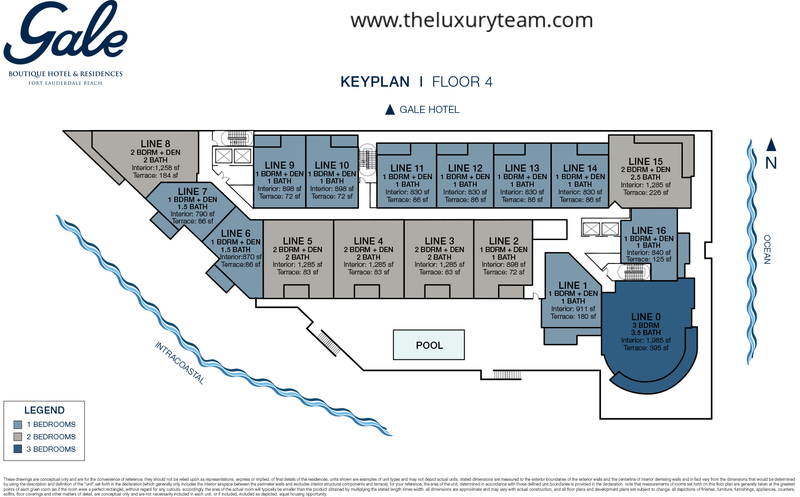 To set an appointment to view these condos, talk to The Luxury Team. Our agents would love to tell you anything you want to know about these condos. Please call or use our form to submit any questions you have about these condos.